Last fall, I had the opportunity to take a trip to Washington D.C. with my husband. He is a principal and his school received a national award, which was very exciting! We left the kids at home for this trip, and took the opportunity to try a few new activities. We, with another couple, booked the Big Bus Night Tour of Washington D.C. after his daytime meetings and it was a fun group activity. We enjoyed dinner in one of the restaurants at Union Station afterward, and agreed that the Big Bus Night Tour was one of the highlights of the trip. 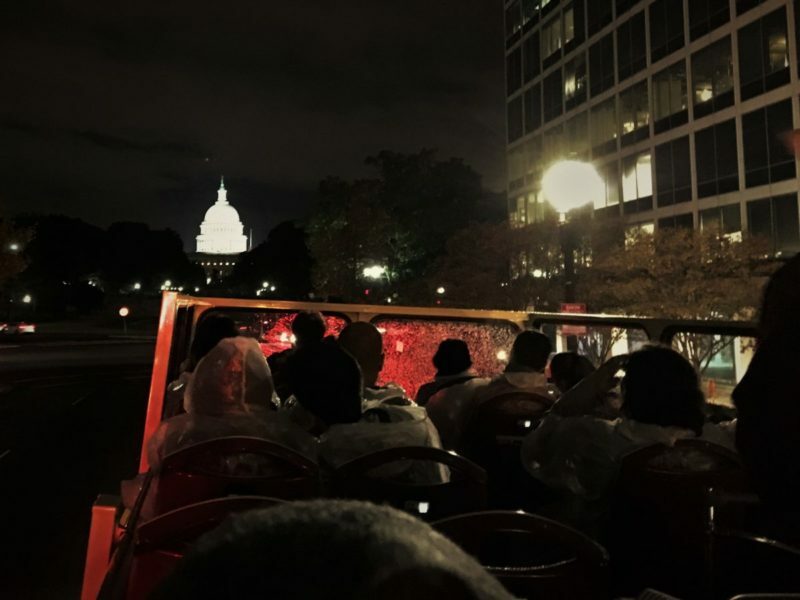 Here’s why we liked the Big Bus Night Tour of Washington D.C. and my tips for making the most of it. Why take a Big Bus Night Tour? Washington D.C. looks different at night. All the famous monuments like the Lincoln Memorial, Washington Monument and Jefferson Memorial are lit. Well-known buildings like the U.S. Capitol Building and the White House are as well. Nighttime temperatures are a lot nicer in the summer, and fairly mild the rest of the year. We took our tour in early November. The Big Bus Night Tour of Washington D.C. helped us cover a lot of ground in less time. All the major monuments and buildings on the tour are within walking distance of each other, but it’s miles of walking to see them all. The monuments are pretty safe at night because they are still crowded with visitors. We have walked downtown and in other parts of Washington D.C. after dark with no problems. Nevertheless, I felt safer on the Big Bus Night Tour than on my own. Finally, it’s fun to have a live tour guide. Our Big Bus guide was informative and entertaining. If you enjoy the tour, your guide will appreciate a cash tip at the end. Big Bus offers day tours and night tours in Washington D.C. and one big difference is that the Night Tour does not let you hop-on/hop-off. During the day, you can get off one Big Bus, spend as much time sightseeing as you like and then board another Big Bus. On the Night Tour, you board the bus at a scheduled time, drive around the city with a guide, and return to Union Station two hours later. The Night Tour includes a stop at Lincoln Memorial where we had the chance to get out and see Lincoln Memorial and Vietnam Veterans Memorial up close. The Big Bus Night Tour leaves from two locations each evening. We left from Union Station, which is a sightseeing opportunity on its own. It’s a beautiful building and great place for shopping and dining. It’s a Metro stop too. The other location is the Willard Hotel, near the White House. Rain ponchos and ear buds are complimentary. The weather was rainy during our trip, but we wanted to sit on the top of our double-decker Big Bus. The rain poncho was nice to have, just in case. We were sitting just a few seats from our guide, but couldn’t hear him well without the ear buds. His microphone and the ear buds ensured that everyone on the bus could hear the tour. The tour is available in several different languages. Big Bus uses bright red double-decker buses, and we loved sitting on top in the open air. The weather was rainy and chilly that night, so some passengers were glad to sit below. The bus stops frequently so passengers can take photos from their seats. We drove all around the National Mall and the Tidal Basin. We saw the Washington Monument, Jefferson Memorial, National WWII Memorial, White House, Capitol Building, several Smithsonian Museums and many others. Near the end of the tour, we disembarked to visit the Lincoln Memorial and Vietnam Veterans Memorial on foot. There are several good ways to buy tickets for the Big Bus Night Tour of Washington D.C. Night Tour tickets can be purchased on their own, or bundled with the Hop-on, Hop-off Day Tour and other D.C. activities. You can buy tickets for all Big Bus tours at www.bigbustours.com. Save 10% on the Deluxe Ticket when you buy online. Click the button to see all your options on the Big Bus Tours website. The Go Washington D.C. Card is a great way to save up to 40% on activities like Big Bus Tours, Mount Vernon, International Spy Museum, Newseum, Madame Tussaud’s and more. I bought the 3-Choices Explorer Pass before my trip. Between Go Card and all the free activities in Washington D.C., I had lots of fun things to do. We didn’t know my husband’s itinerary before the trip, and he ended up doing the Newseum and Big Bus Night Tour with me. He paid $65 at the door for two activities, while I paid $54 for those two, plus one more with Explorer Pass. Visit gocity.com/washington-dc or click the button below to learn more. I bought my Go Washington D.C. Card before the trip, but I bought same-day tickets for the rest of my group. There are a couple of Big Bus booths inside the lobby of Union Station where you can purchase tickets anytime. We liked the Big Bus Night Tour of Washington D.C. and recommend it for families. It’s convenient, safe and fun. Be sure to buy online in advance to get the best price. Do the night bus tours sell out quickly or is it easy to buy tickets at Union Station the night you want to ride? Do you know the start time?